Even if you never tag or rename your photos, Lightroom should be able to find just the one you're looking for. Lightroom users who sync their photos to the app’s Web module can now test out a new and improved way to locate specific images: Search. 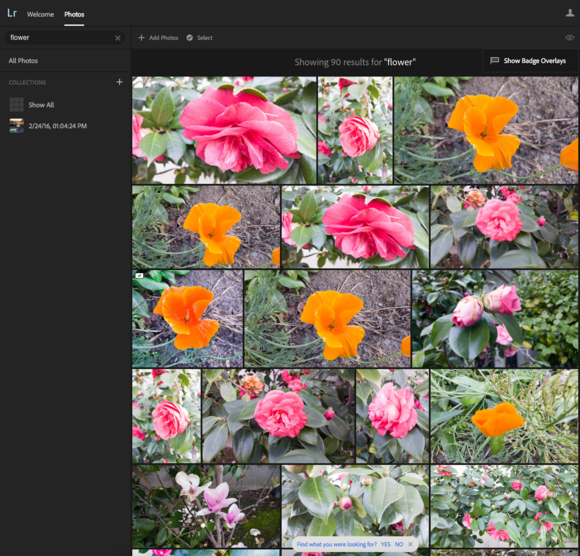 As part of a new Lightroom Technology Preview series debuting today, Adobe is making the search feature available to Creative Cloud Photography Plan subscribers to test and offer feedback before finalizing it. As described in a blog post Friday morning, Search lets you type in a keyword to enable Lightroom to display all related images it finds in your library, even images you never tagged or labeled. Macworld got to test out the new feature early, and it worked quite nicely. Just log in to your account, and click on the Lr logo at the top left to access the menu. There, you’ll find the new Technology Previews feature. Click to enable it, and a new search bar will appear in Lightroom’s online interface allowing you to type in keywords. Not only did Lightroom find all my flower photos, but subsequent searches for "poppy" and "roses" pulled out just the right kinds. A serach for "lily" was only partly successful, though. There is no Boolean search: you must type in one keyword at a time. 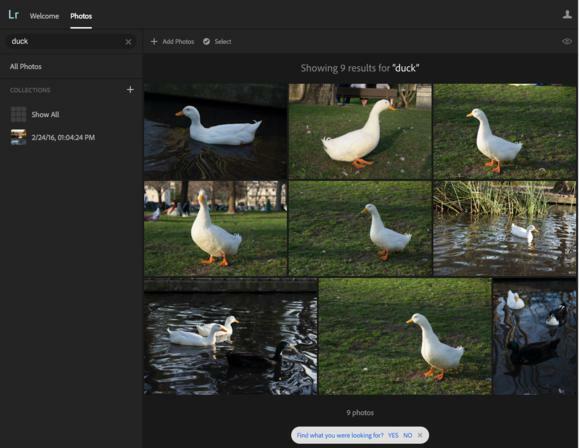 Type in the word “duck,” for example, and all the photos in your library that you shot at the duck pond will appear. Images do not need any prior classification, flags, or IDs—they can still have the auto-generated names directly from your camera card. I found a few interesting items from my small library. Search recognized three images when I typed in “bicycle” but only two of the three when I typed in “bike.” It brought up an extra image containing water when I typed in “pond” instead of “duck.” It found all my California Goldens when I typed in “poppy,” proving it could recognize a particular flower. It recognized all the roses, but only one of 14 lily images. When I searched for “letters” I got one of three keyboard images, but not a lettered sign that was also in the library. Searching for “type” and “text” brought no results. Search is accomplished via a Machine Learning-based image analysis technology that works with the photos in Lightroom’s online repository. Images can come from Lightroom Mobile, Lightroom desktop, or even photos uploaded to Lightroom online from your hard drive via Creative Cloud. Adobe is hoping to gather feedback on the search functionality from users before finalizing the feature. It also plans additional power for search to include metadata and more. The company promises privacy with this feature and assures that only users can search their own photo libraries. Search is the first in a new series of planned Technology Previews. Adobe is not disclosing details or a timetable for any future previews. For now, Search is in English only, but will be available in other languages when the feature is officially launched.